Theresa May went head-to-head with Jeremy Corbyn in the House of Commons. Brexit took a bit of a back seat as Jeremy Corbyn returned to one of his favourite themes at PMQs - poverty levels in the UK. He began with a Bank of England forecast that the economy would grow at the slowest rate for a decade this year. What was to blame, he asked the PM, her "shambolic" handling of Brexit or her government's "failed austerity policies"? The UK economy was growing at faster rate than Germany, replied the PM, and there were "more people in work than ever before". The Bank of England says the economy has a one-in-four chance of slipping into recession, said Mr Corbyn, and UK manufacturing is in recession. Was this down to her "shambolic" handling of Brexit or her government's "lack of an industrial strategy"? The economy had seen "persistent growth" under this government, said Mrs May - and a Labour government would mean a "run on the pound, capital flight and £1,000bn of borrowing". Manufacturing industry was declining, said Mr Corbyn, and skilled jobs were being lost. At the same time, the "top 5th richest people in this country" had seen a 4.7% increase in their income. while the poorest fell by 1.6%. Will the PM end the "benefit freeze"? Or, he added, "does she believe that rising poverty is a price worth paying?" Income inequality is lower than that inherited from the Labour government, said Mrs May - and her government had introduced the National Living Wage. The Tories had opposed its forerunner the National Minimum Wage, Mr Corbyn pointed out - before calling on her to back striking workers at the Department of Business on £7.83 an hour, who are demanding an increase to the London Living Wage (£10.55 an hour). Then it was on to Universal Credit and the admission by Work and Pensions Secretary Amber Rudd that it was driving people to food banks. Would she halt the roll-out or was "rising poverty a price worth paying", the Labour leader asked. The government had "made changes" to Universal Credit "so people keep more of what they earn", said Mrs May, "and get their money sooner". But Mr Corbyn wasn't finished with Amber Rudd - there had been an 80% increase in demand for food banks in her Hastings constituency, which the charity, the Trussell Trust, had put down to problems with Universal Credit. He called on the prime minister to end the two child limit, scrap the benefit cap and restore the Sure Start centres lost under her government. Mrs May said the government wanted to ensure the welfare system is fair for those who need to use it - but also for the taxpayers who fund it. "Work is the best route out of poverty," she told the Labour leader. But some people are doing two or even three jobs and were having to use food banks "just to feed their children", said Mr Corbyn. Labour MPs joined in as he recited some statistics: "Income inequality up! Child poverty up! Pensioner poverty up! Homelessness up!" Then it was back to where he started: "This government's shambolic handling of Brexit is compounding years of damaging austerity." "Are any of these burning injustices a priority for the prime minister?" he asked. Mrs May said "manufacturing is not in recession". And she said he was wrong about the lowest paid, who she said had seen the "highest rise in their pay for 20 years" as a result of the National Living Wage. Mr Corbyn had voted against government measures to help the low paid, she told MPs, adding: "It's working people always pay the price of Labour." The SNP's leader at Westminster Ian Blackford called on the prime minister to rule out a no-deal Brexit. Tory Brexiteer Peter Bone raised cabinet leaks, suggesting - to laughter from MPs and Mrs May - that it would be easier to televise cabinet meetings. Tory MP Rebecca Pow called for a crackdown on celebrity-endorsed diet products. 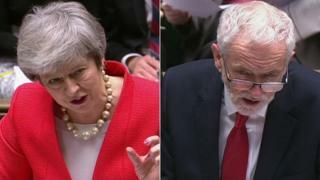 A score-draw PMQs, with Jeremy Corbyn on an effective riff about rising inequality, delivering a wounding statistic about the rise in food bank use in the constituency of the Work and Pensions Secretary, Amber Rudd. Theresa May hit back by rubbing salt into Labour's anti-Semitism row. Insofar as the exchanges between the three main players (the PM, Mr Corbyn and the SNP's Ian Blackford) touched on Brexit, they didn't stray much beyond the usual ritualistic formulae. Several MPs at the centre of their own dramas did appear. Ian Austin, newly resigned from Labour, sat, none the less, in his usual spot on the Labour benches. There was a brief sighting of the newly-resigned Alberto Costa, lurking just behind the Speaker's Chair, smiling a little wistfully. Chris Williamson, the close Corbyn ally at the centre of a row about his remarks on anti-Semitism at a Momentum event, was not visible. The most interesting moments were generated by two ex-ministers, with Robert Halfon hoping that Tory-held constituencies would be eligible for a piece of the pie from the new social fund being set up by the government in response to the pleas of Brexit-supporting Labour MPs. His delicately-worded question hit home, and received a conciliatory response from the PM. As did Justine Greening's suggestion that the government might re-introduce student grants....the former education secretary, sometimes spoken of a s possible defector to the new Independent Group, was rewarded with praise for her commitment to social justice. The PM has a party to hold together, and with its fault-lines increasingly visible, she is going out of her way to soothe her critics. Oh and the best joke came from the Conservative Peter Bone, with a mordant suggestion that the increasingly leaky meetings of the Cabinet should be televised. That produced a rare moment of unity as everybody, even the cabinet ministers, laughed.